AIDC has vast experience in grading diamond rough and analyzing the quality standards essential for a piece of rough to have the potential to polish into a special colored diamond of high value and quality. We assist our clients in fundamental sawing techniques as well as the procedure of bruting, cutting and polishing in relation to the facet placement to maximize color saturation in the stone. 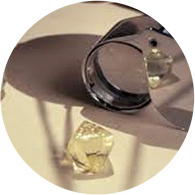 It is also important to examine rough octahedrons and misshapen crystals as well as surface markings to determine which pieces of rough within a parcel are the most valuable and have the potential to polish out into a special diamond. Examining rough crystals under the correct lighting is essential in identifying the potential weight retention, inclusion patterns and the ideal faceting for that piece of rough to maximize the fire and brilliance in the polished diamond. This helps in determining the potential color of the stone based on surface textures and plotting inclusions for removal during polishing by identifying how and where to open rough windows. All of these techniques are critical in understanding pricing of parcels along with individual crystals as often one stone in a parcel can bring back the value of the parcel using the correct identifying methods. Our expertise in Fancy Color rough crystals and identifying gem quality rough to be faceted into the fancy shapes is critical in identifying value in the rough diamond market. This includes the analysis of fancy color banding and zoning, rough analysis for color, clarity and price, and proportion as it affects the value of fancy colored diamonds.